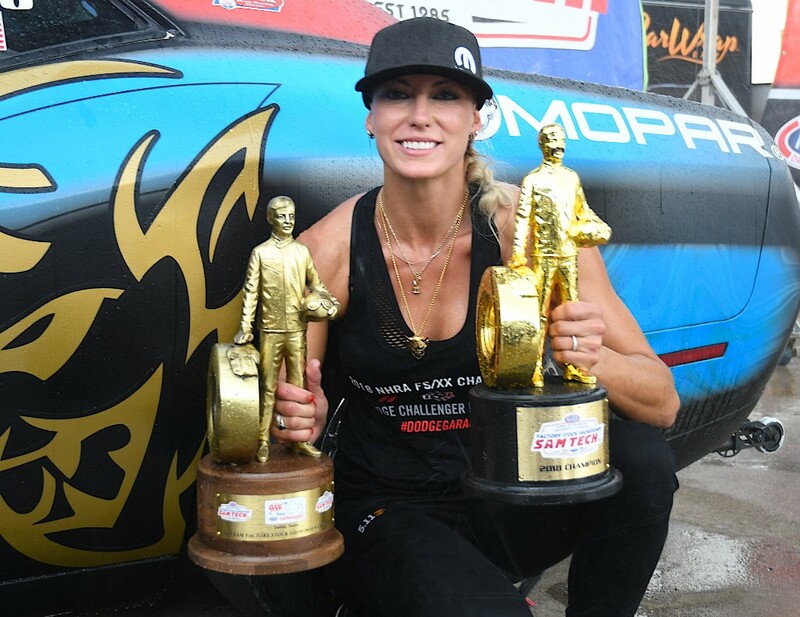 ENNIS, Texas (October 7, 2018) – Leah Pritchett clinched the 2018 SAM Tech NHRA Factory Stock Showdown Series championship in her Mopar Dodge Challenger Drag Pak at the AAA Texas NHRA FallNationals, racing to her third consecutive win of the season and earning her first championship in her first full year competing in the class. Leah Pritchett overcame a No. 9 qualifying spot outside of the top half of the field to defeat the higher-qualified Kebin Kinsley, posting a 3.831-second at 324.20-mph run en route to leading from start to finish. 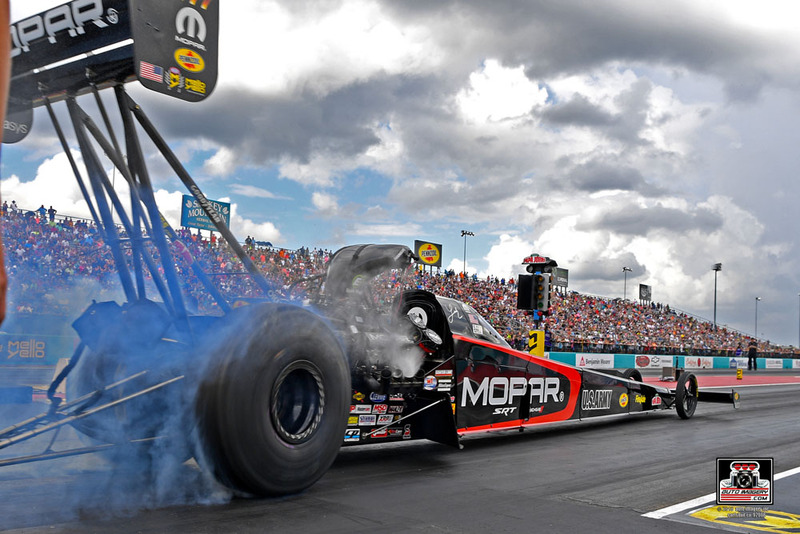 In the quarterfinals against Clay Millican, the Mopar Dodge Top Fuel driver matched her opponent’s 0.072 reaction but dropped a cylinder right at the launch, ending any chance at a deep Dallas run. 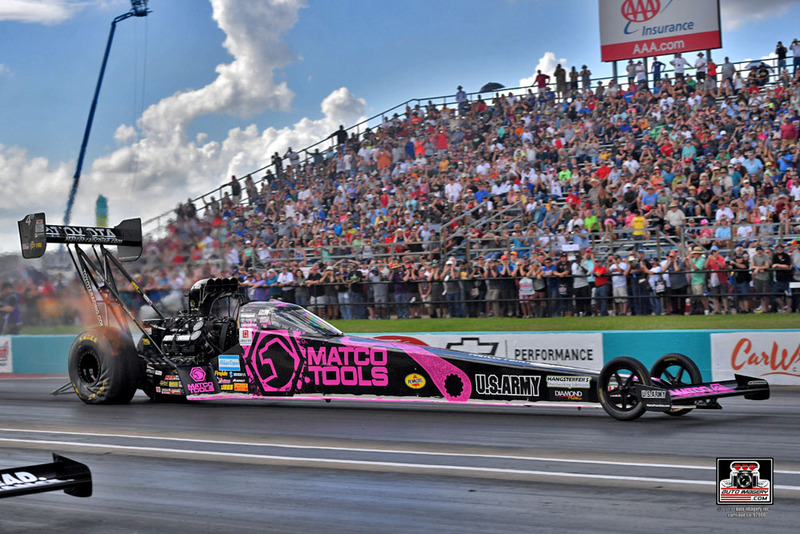 Pritchett is fourth in the Top Fuel standings with her hopes for two titles still alive heading into the all-important final three-race stretch. After a stellar final qualifying run late Saturday vaulted Schumacher to the No. 3 spot on the elimination ladder, “The Sarge” laid down a smooth and steady opening-round win over No. 14 qualifier Shawn Reed. 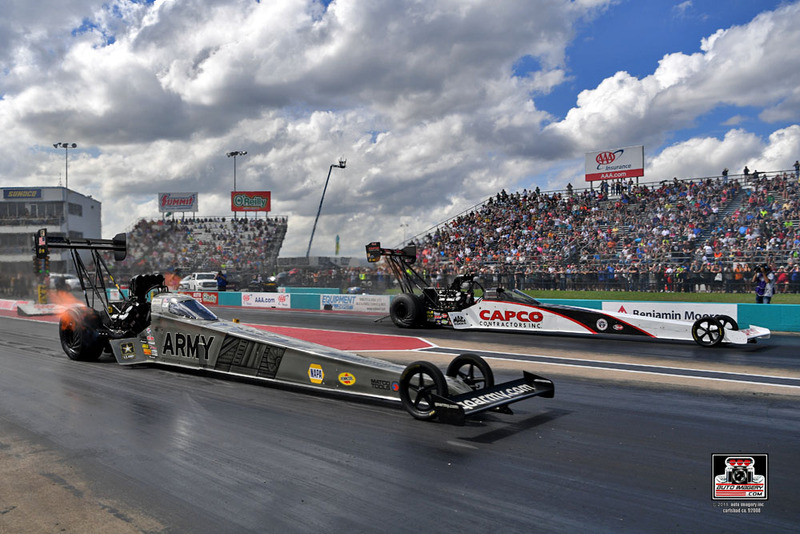 The U.S. Army car crossed the finish line in 3.747-seconds at 325.69-mph to Reed’s 3.900-second pass. That set up a meeting with teammate Antron Brown, their third intramural elimination battle in the last six events. Schumacher was solid and steady once again with a run of 3.817-seconds at 323.89-mph while Brown smoked the tires midway down the track. Trailing Torrence by 125 points at the start of the day, Schumacher and the U.S. Army team were hoping to turn his playoff momentum in their favor with the chance to leave Texas Motorplex having significantly downsized that deficit. But it was not meant to be as Schumacher hazed the tires at halftrack and had to settle for a run of 4.917-seconds to Torrence’s 3.779 seconds pass. Schumacher, the winningest Top Fuel driver at the Texas Motorplex with six career event titles, will enter the next event ranked third. 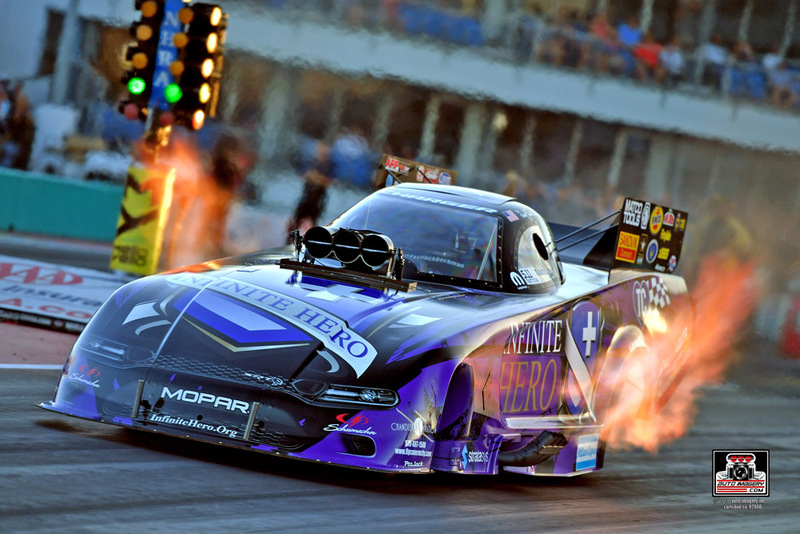 “Fast” Jack Beckman, a two-time runner-up at Dallas, qualified strong in his Infinite Hero Foundation Dodge Charger SRT Hellcat Funny Car, collecting the No. 5 spot on his final qualifying run. 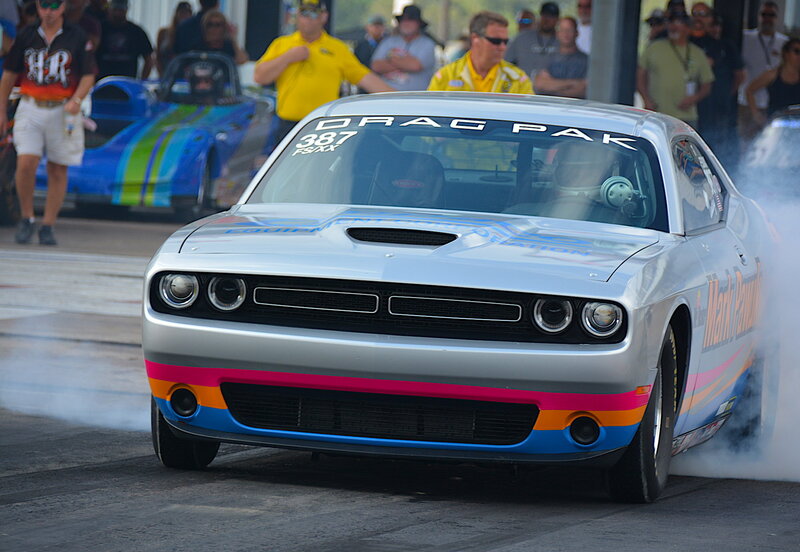 A powerhouse matchup against Courtney Force awaited him in the opening round. The elite pair entered the race deadlocked at 10-10 in previous matchups, and were appropriately enough dead even off the starting tree with identical 0.082 reaction times, but Beckman was able to claim the early lead and hold off Force in a tight drag race with a winning 3.969-second at 317.27-mph pass. In the quarterfinals, the Infinite Hero team faced J.R. Todd. Beckman trailed off the start but quickly reclaimed the lead before putting out a cylinder and veering toward the centerline, forcing him to back off as Todd went down the strip for the win. 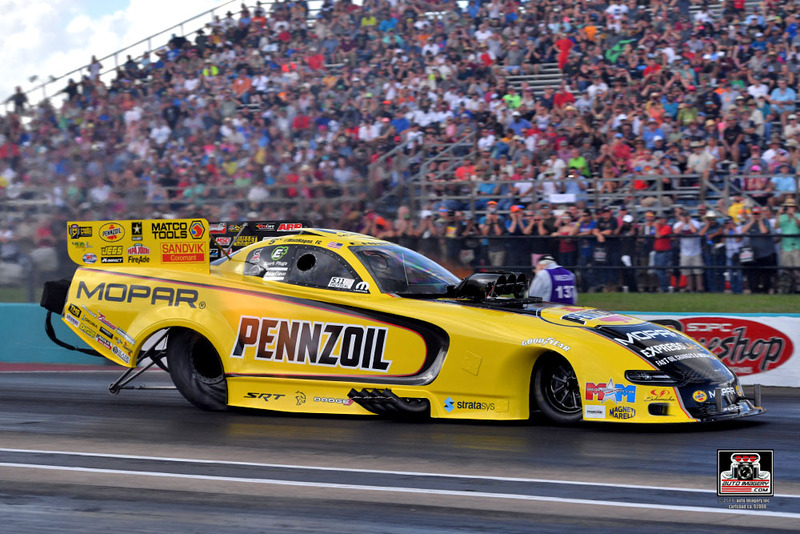 Beckman, the 2012 NHRA Funny Car champ, leaves Dallas eighth in the standings. Starting race day from the No. 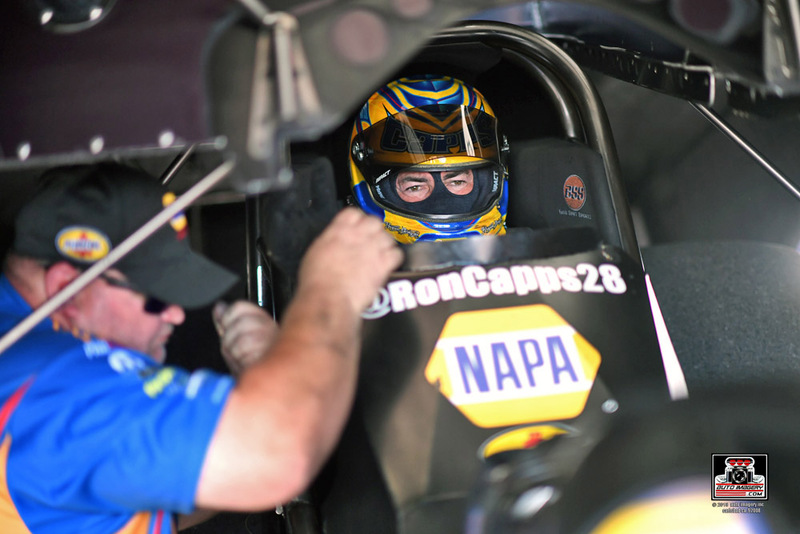 7 position, Ron Capps faced John Force in a marquee first-round matchup rife with Countdown implications. It was the 97thtime the two winningest Funny Car drivers in the sports’ history had met in competition. Capps launched his NAPA AUTO PARTS Dodge Charger R/T off of the starting line first and led until the 600-foot mark before Force pulled ahead and was able to drive away for the win, ending Capps’ day. 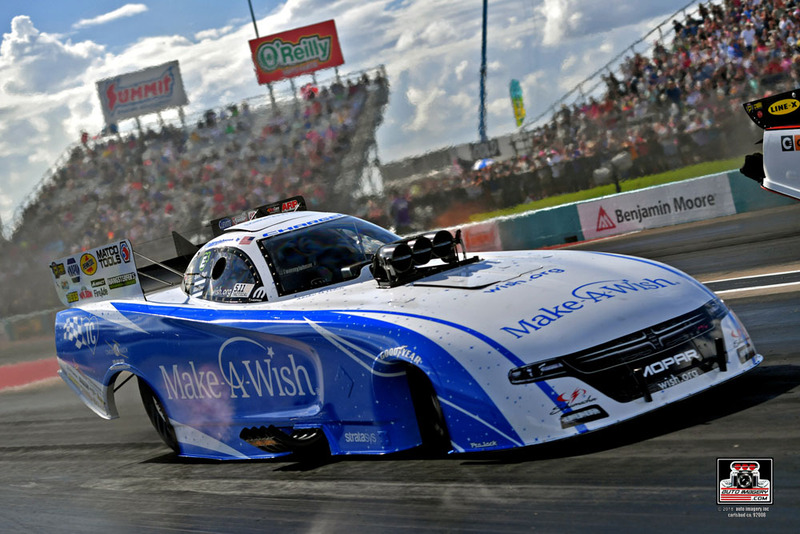 While the first-round loss caused Capps to fall from fifth to sixth in the NHRA Countdown to the Championship standings, the points are still relatively close among the Top 10 ranked Funny Car pilots as the NHRA heads to the fourth event of the six-race playoff schedule. “It was a strange weekend of qualifying here at Dallas for a lot of cars. It was luck of the draw for race day and when you have a team like John Force first round, it’s going to be tough. It was a close race. I didn’t see him until right at the end. 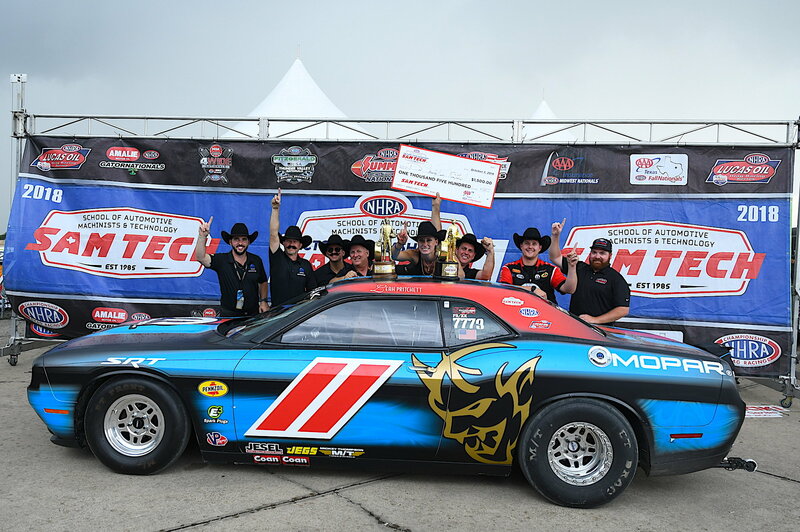 After battling poor track conditions and losing out on a qualifying session due to inclement weather, Mark Pawuk qualified ninth in his Empaco Equipment Mopar Dodge Challenger Drag Pak. Against Kevin Skinner, Pawuk had a slight starting line advantage but was unable to chase down his opponent, causing the U.S. Nationals runner-up to bow out early at the final Factory Stock Showdown event of the season.